According to an article “Natural Product Research” which was published in 2013 strawberries are filled with folate, fiber and vitamin C is good for health as it can keep disease away from us. But still under some situations strawberries can be bad for you. Is Eating Strawberries Can be Bad for You Is Eating Strawberries Bad for You? Bacteria: According to Texas A&M AgriLife Extension, strawberries also can cause hepatitis A, salmonella or E. coli if get bacteria. Do not store strawberries near poultry or raw meat. Because strawberries can easily catch soil bacteria, so make sure that you wash them right before you eat them. Allergy from Strawberries: If you have allergy from fruits than strawberry can cause dangerous or unpleasant symptoms. If you have Pollen or fruit Allergy than it can be dangerous to you as it is from the same rose family. It can cause itch on lips, mouth and ears. So you should avoid Strawberries if you are allergic to it and get medical help faster if you feel such symptoms. Mold: Strawberries very easily get mold and perish. Buy firm, red strawberries and Do not wash them if you are storing them in refrigerator because moisture can cause them to mold faster. Eat them soon, don`t store for long time. If you see any strawberry getting mold than tossed out the whole pack. Pesticide Residues: The EWG, The Environmental Working Group`s analysis from U.S. Food and Drug Administration and the U.S. Department of Agriculture has ranked strawberries on No. 2 on its list of foods with Pesticide Residues. 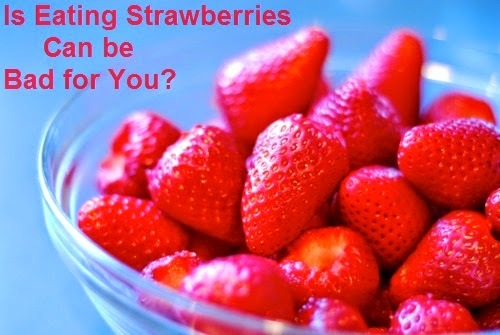 The EWG said that they are not recommending to people to strawberries as their health benefits are more than the risk. But it is a good if you buy organically grown strawberries and wash them right before eating.